In her ESPN column, Jemele Hill writes that she was excoriated by Joe Paterno fans because of a column she wrote saying Penn State had no choice but to let him go. She concludes, "Hypocritical protectionism is dangerous." I'm not surprised that my column on Joe Paterno elicited such a strong reaction. I anticipated that, since the story is centered on his knowledge of and reaction to the alleged sexual abuse of children. 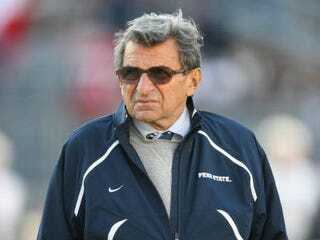 But I didn't anticipate that the majority of the nearly 1,400 emails I received in response to it would express strong support and sympathy for Paterno. I see an irony here in that a lot of the people who responded in support of Paterno sound exactly like those who supported Michael Vick, both before and after he was convicted of dog fighting charges. Read Jemele Hill's entire column at ESPN.